When I was a little girl I often ran barefoot across the sandy cliff tops to play in a real castle where fairies and ghosts kept me company. People used to tell my father it wrong to let me play there, as it was cursed by some evil witch. But the warning fell on deaf ears and consequently my imagination became as wild as the child it encompassed. 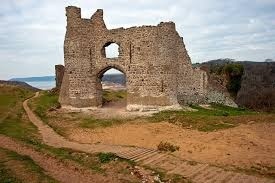 Since the 12th century, Pennard castle has stood on top of steep cliffs overlooking a valley where a river winds its way through the grooves towards the sea. The natural beauty which surrounds it is home to an abundance of wildlife and if you have the time, it is a magical place to visit. And so once more, I trekked across the sand dunes to discover that the magic is still there, within the old stone walls that remain. And so are the fairies and the ghosts, especially during the golden hour of day.